Modern medicine emerged in the second half of the 19th century, as innovative technologies and new theories of disease paved the way for extraordinary medical advances. For Jews, and for the Jewish community at large, the field of scientific medicine presented new opportunities, new challenges and new ways to engage with modernity. 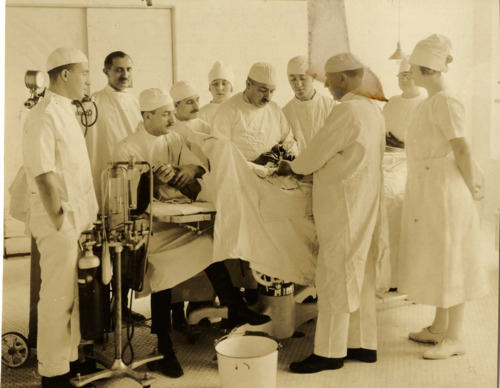 Through an array of original medical instruments, artifacts, documents, letters, photographs and video, Trail of the Magic Bullet: The Jewish Encounter with Modern Medicine, 1860-1960, explores the Jewish encounter with modern medicine on an individual, communal and religious level. The exhibition, on display at the Yeshiva University Museum through August 12, brings the conversation up to the present, concluding with a specially produced film that examines key issues in contemporary Jewish bioethics. Einstein's Rabbi Dr. Edward Reichman speaks to local high school students. On March 21, Trail of the Magic Bullet was the centerpiece of two educational initiatives. In the morning, in a program organized by Ilana Benson, museum educator at the YU Museum, 80 students from four Jewish New York area high schools used the exhibition as the jumping off point for discussions around the role of halakha in medicine and the training of the Jewish medical student across history. Science, pre-med and AP biology students from Yeshiva University High School for Boys, Yeshiva University High School for Girls, DRS Yeshiva High School and Yeshiva of Flatbush participated. In tandem with tours of the exhibition, Rabbi Dr. Edward Reichman of the Albert Einstein College of Medicine led the students in discussions of key medical case studies and gave an interactive lecture on the history of the training of Jewish medical students. In addition to seeing a range of rare medical artifacts, documents, posters and letters, the students from these schools had the chance to engage on topics such as organ donation, genetic testing and general Jewish medical ethics. In the evening, the Yeshiva University Medical Ethics Society also brought 40 undergraduate students to the museum to experience the Trail of the Magic Bullet exhibition, and to participate in another lecture given by Reichman. The students heard about and discussed the experience of Jewish doctors in the modern medical field and developments that have facilitated the participation of Jewish doctors within modern medicine. The program featured a rich and engaging discussion around such issues as the acceptance of Jews into secular medical schools, advancements in medical technologies, and the role of halakha in connection to the medical field and contemporary bioethics. These two programs highlight the educational impact and potential of the exhibition and attest to the value of the collaboration between the YU Museum and Einstein. The exhibition celebrated its opening with a program on February 29, 2012, which featured a discussion by Dr. Edward Burns, executive dean of Einstein, on the Jewish role within the medical profession; and the screening of “Heal, You Shall Heal” (produced and directed by Ilana Trachtman), a film that was commissioned and developed by YU Museum in conjunction with the exhibition.